You are currently browsing the tag archive for the ‘Guinness’ tag. While I can’t claim to be a die-hard Simpsons fan, the old faithful show is always on whenever it’s needed to fill a half hour in prime time between other shows. It’s always light (in an adult humour sort of way) and funny – reliable. I do admit that I have gotten into the habit of setting my PVR to record the newest Fox cartoon family lineup every Sunday now, collecting the latest from Family Guy, American Dad and The Simpsons. But – this week, that new episode which will air on Sunday March 22, 2009 will actually be almost 5 days stale, sort of. For the first time in the 20 year history of The Simpsons, the new episode will air in a region of the world other then North America first and on a network other then Fox. Sky1 in Ireland has the prestigious right to air this weeks brand new Simpsons episode before anyone else. That’s because the Simpsons family has packed up and headed to Ireland for a St. Patrick’s Day special that will be memorable, without question. 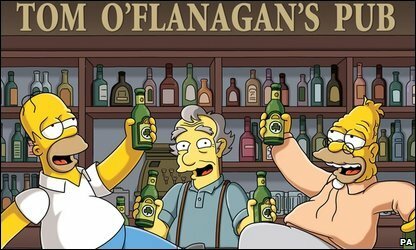 In an episode titled, In The Name of the Grandfather, Homer and Grandpa take off to the green isle and visit landmarks like the Guinness brewery and Grafton Street. The episode will also feature special voice appearances by Belfast-born actor Kenneth Branagh (Valkyrie), Oscar winners Glen Hansard and Marketa Irglova (Once). Executive producers of the show, Al Jean and James L Brooks as well as Nancy Cartwright who is the voice of Bart and many others, are traveling to Ireland specifically for a special screening of the episode. The only things that they’ll reveal about the plot for the episode are that Homer and Grandpa attempt to buy a pub, but it may not exactly work out in their best interests. Whatever happens to the Simpsons this St. Patrick’s day, it is clearly evident that even they cannot escape the world’s desire to be Irish for a day! With St. Patrick’s Day nearing, John Molloy, relocated to Vancouver, is busily representing the Jameson Irish Whiskey on a cross Canada tour. He was kind enough to give me an education on what the spirit was all about and what I’d expected to be a story like any other became memorably personal. Molloy, who is one of 29 country-dedicated brand ambassadors, spoke candidly and passionately about Jameson and even made me consider it as an alternative. It’s not just a stuffy drink for old men, it’s evolved and that’s a huge part of what Molloy is spreading the word about. Molloy himself is quite young, something Jameson looks for in its brand ambassadors along with the requirement of being Irish. He’s the first rep to be placed in Canada and Vancouver was the natural spot owning a quarter of Canadian whiskey sales. Jim Morey, known as the “godfather of whiskey” agrees and has given it a 94/100. Industry bar setting magazine Impact has called Jameson the Hot Brand of the Year for the last eight, consecutively and the company garners $2.7 million in annual profit, all from one distillery in Ireland. The road was challenging though, let’s not forget prohibition and the fact that Jameson’s been around since 1780. But, Jameson held on in a country that went from 2000 distilleries (on a land mass you can drive across in 2 and a half hours) to only 3 because of a 95% market loss for Irish whiskey from 1845 – 1933. It would seem survival was directly correlated with quality in this case. Not only is it light, crisp and clean, there also isn’t a bottle younger then 5 to 7 years old. Important, because it’s legally sellable after only 3 years, but John Jameson himself said it was worth the wait. 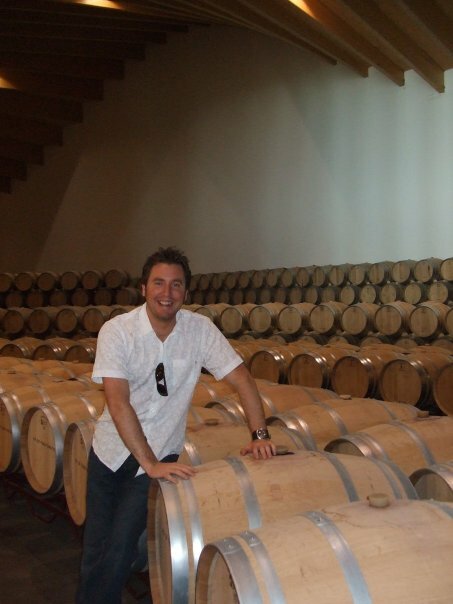 The brand also offers a 12 or 18 year and a gold or vintage, blend’s of 18 and 12 and 24 and 18. Also tied to quality is the source, which also hasn’t changed for Jameson since day one. The barley has all come from the same farmers and fields from within 50 kilometres for the last three generations and a fresh water source runs right through the distillery. That building also houses 32 warehouses where all the casks are held full of patient spirit. Remember how long it has to age in those? The equivalent of 6000 bottles gets lost ever day in what’s known as the angels share, or more scientifically – evaporation. So, never really liking Guinness, with my new found knowledge and appreciation for a whole new category of sprits I’ve decided to give Jameson its fair shake. The same afternoon while picking up my usual for the weekend, I also picked up a small bottle of Jameson for $16.00, which is hanging out in my fridge waiting to be mixed with ginger ale, coke or cranberry juice to John Molloy’s suggestion for St. Patrick’s Day 2009. We’ll see how it goes!